1. 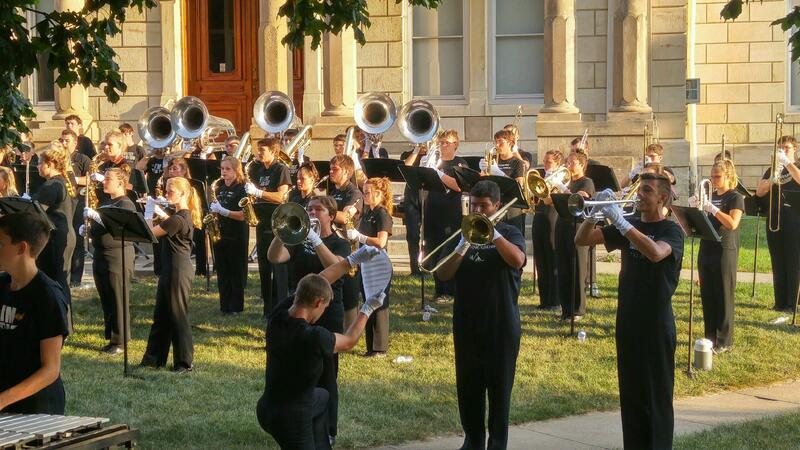 The Winterset Huskies Marching Band, which has been in band camp all week, performed the newly-learned set for their 2016 fall show last night on the courthouse lawn. This year’s music will be from Fiddler on the Roof. 2. 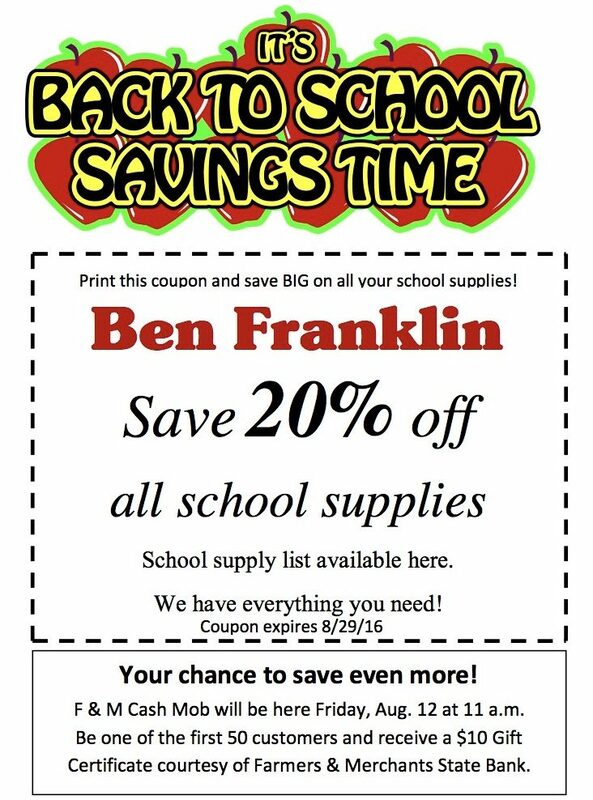 The Winterset Ben Franklin is offering 20% off school supplies from now through August 29th, with coupon. Find yours in the Shopper or print the one below. 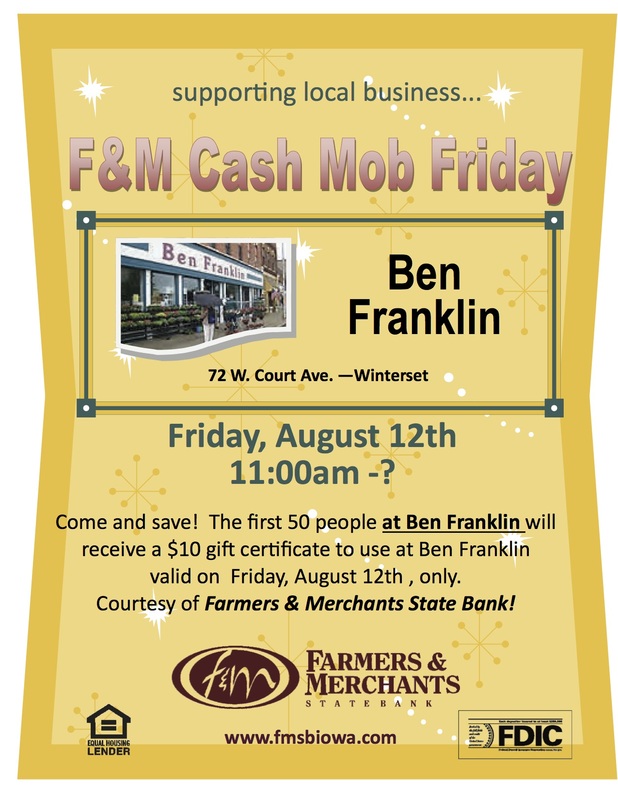 Click for a printable Ben Franklin coupon. 3. 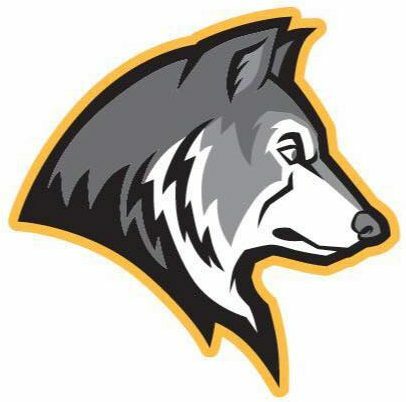 Next Friday, the 19th, is Meet the Huskies Night at McGaffin Field, starting at 5:00. The Quarterback Club’s concession stand will be open and will be serving steak sandwiches. The Booster Club will have their cart open and ready to accept memberships and sell Huskies apparel. Introduction of teams begins at 6:00. 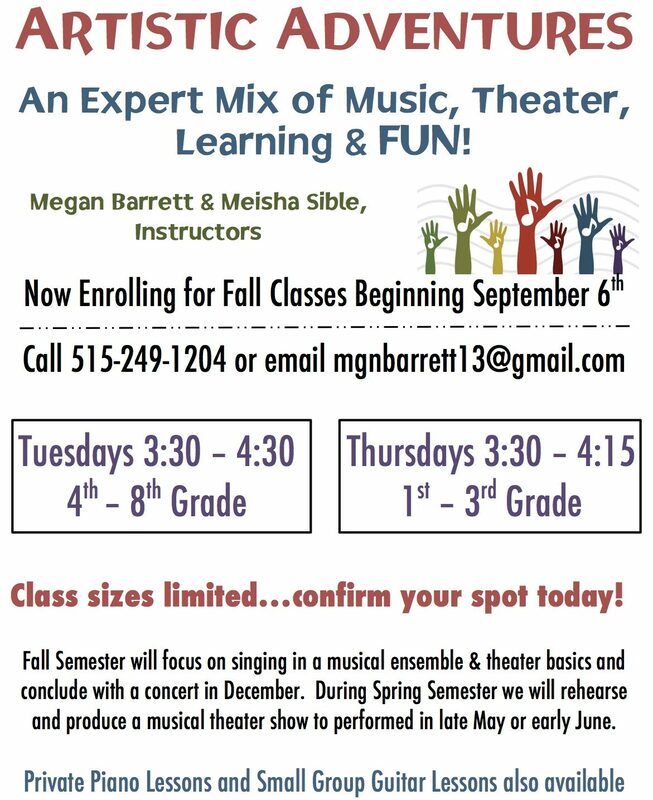 Also, here’s a new opportunity for 1st-8th grade students being offered by local music and theater instructors, Megan Barrett and Meisha Sible. They are enrolling now for classes that begin on September 6th. Click here for a registration form, or visit their website at www.HaveArtisticAdventures.com for more information. The farmers market on the square from 8:00 to noon on Saturday in Winterset will feature sweetcorn, tomatoes, and more. 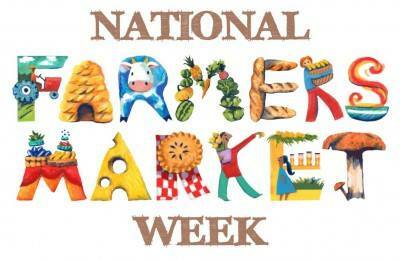 Show your appreciation for our local vendors on the last day of National Farmers Market Week, August 13th! Re:home is open through Saturday and next weekend as well, Thursday through Saturday. Tomorrow night (Saturday, August 13th) at the Winterset Aquatic Center is the annual Dive-In Movie event hosted by the Winterset Park and Recreation Department and sponsored by Madison County Realty. They’ll be showing The Incredibles (PG) at 8:45 with free admission and popcorn. 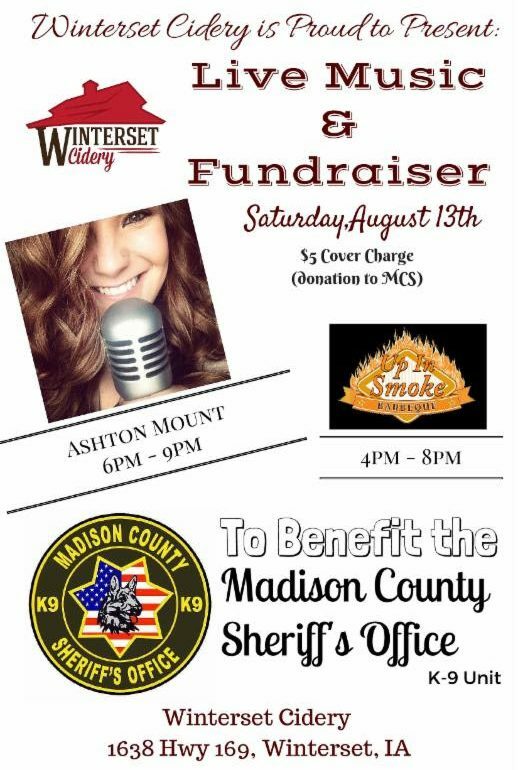 Also on Saturday evening, Winterset Cidery is hosting an event to benefit the Madison County Sherriff’s Office K-9 Unit with Up In Smoke barbecue and music by Ashton Mount. 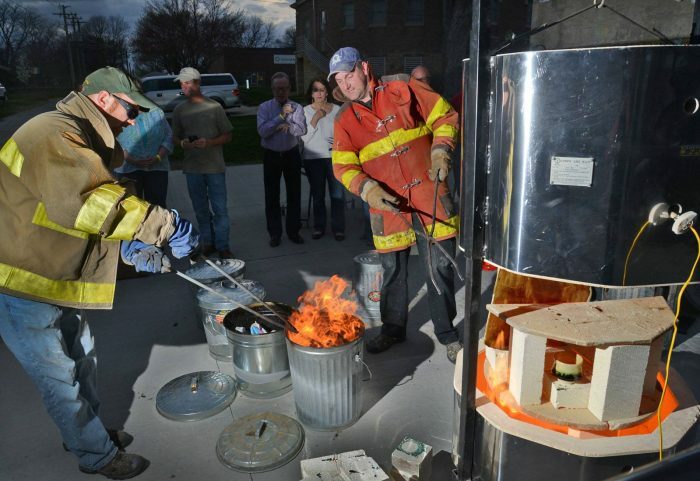 Madhaus Gallery’s next raku firing is scheduled for August 20th starting at 10:00 am. 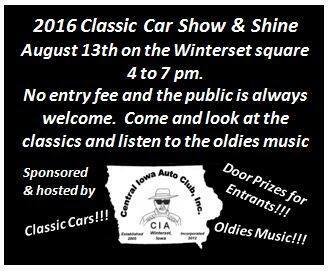 Reserve your spot today by calling Robin at 515.707.4309. Their friendly potters from Minnesota, Chad Jerzak and Mark Lusardi, are coming down to lead the event. Don’t miss this wonderful opportunity to ‘make and take’ a beautiful handmade piece of pottery. Troop 647 is a Winterset Girl Scout Troop that has contributed parts of their summer to volunteering and cleaning up at the Middle River Park. For this project, they are hosting an Ice Cream Social at the Middle River Park. 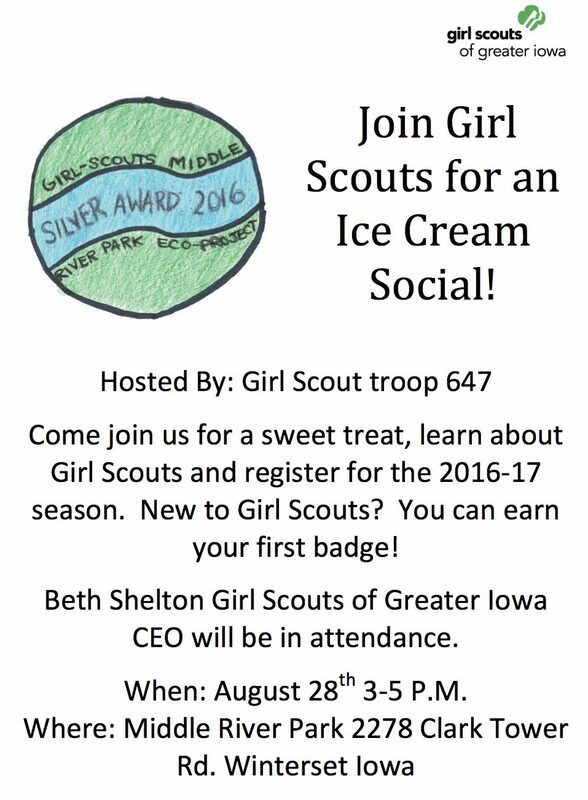 The CEO of Girl Scouts Beth Shelton is coming to this free event. Please come to see the work they have done this summer and enjoy a sweet treat on August 28th from 3:00 to 5:00 pm. And here’s another opportunity to support the youth of our county, coming soon! Click here for a registration form (register by August 30th!) 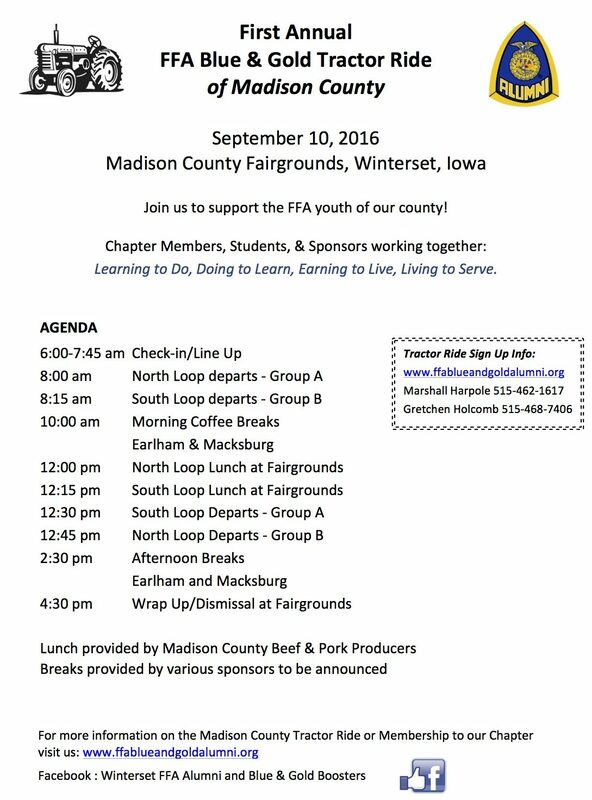 or here to become a sponsor of the First Annual FFA Blue & Gold Tractor Ride of Madison County.